On a recent trip to my hometown, we stopped by the local park, and I was pleased to see that they still had the old-fashioned wooden merry-go-round. 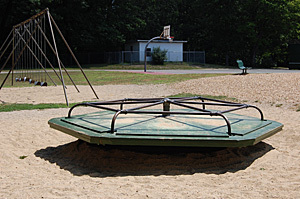 I know it probably isn’t as safe as the newer playground equipment, but I have fond memories of riding on it, spending what seemed like hours seeing how fast we could get it to go and watching the world (well, my little corner of it) spin by in a blur. There are no kids on board in this picture, which is rare, since most every time I looked over, there was at least one kid on it, with a grown-up or older kid pushing. The park also had the old swing set, as well as a newer play area. On that same visit, I talked with the minister of my hometown church. I have known him since the mid-80s, when we were both counselors at a summer camp near Lake Winnipesaukee. Little did I know then that years after taking campers on hikes and leading sing-alongs, we would still be in touch. And this summer, his daughter is a counselor at the same camp. I guess what goes around, comes around, as they say. This is just one more example of what I have long known – it’s a small world, and you never know when or where you’ll meet someone you are connected to. At a networking event or social gathering, talk with someone long enough and you’re bound to find something in common. And that makes it even more important to stay on good terms with the people in your network. Months or years later, you might find that they are connected to that person you want to contact about a business proposition, or know someone who can help solve a problem. Or they may even be the person who hires you for a project, as I have found now that I have my own business. Social media sites like LinkedIn and Facebook now make it easier to stay in touch with your network. I use LinkedIn to keep in touch with all my new business contacts, and Facebook to stay in touch with friends from Oregon to Maine. But that doesn’t replace the good old-fashioned face-to-face contact, or a phone call. Those will never go out of style. This entry was posted in Synchronicity: Musings on Words, Music, and the Arts and tagged connections, contact, Facebook, LinkedIn, networking, social media. Bookmark the permalink.